Mahabharat was compiled by Krishna Dvaipayana Vyasadeva after he finished compiling the Vedas and Puranas. 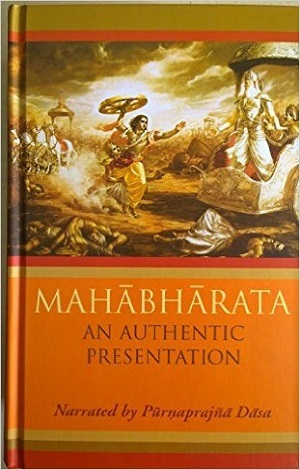 This version of Mahabharata has been retold by Purnaprajna Dasa. The main story of the Mahabhärata is the history of the Kuru dynasty, and the events that led to the great battle at Kuruksetra. It begins with the lives of those from whom the Pandavas and Kauravas, the central characters of the Mahabharat, descended. The story really takes hold when Pandu dies and his wife and five sons arrive at Hastinapura, the ancient city in India, to live under the care of their blind uncle, Dhritharasthra. Besides this main story, however, there are countless other stories told when the Pandavas meet great sages while in exile, or while sitting before Grandfather Bhishma on his deathbed of arrows. This is the way that life was in former times. The arrival of a great sage would be an event to celebrate for everyone in these ancient times. They didn’t have movies, computers, or television and so the great sage, who was a reservoir of histories and deep knowledge, would entertain and enlighten people with stories and the lessons to be learned from them. People would be happy to sit for hours, or even days, and listen to the stories told by the visiting sage, and they considered the lessons learned from such stories to be the essence of education.